Activation of the phosphatidylinositol-3 kinase (PI 3-K) pathway is associated with the proliferation of many cell types, including T lymphocytes. However, recent studies in cell lines stably expressing deletion mutants of IL-2R that fail to activate PI 3-K have questioned the requirement for this pathway in cell cycle regulation. In this study with IL-2 and IL-7, we show in primary T cells that, unlike IL-2, IL-7 fails to induce the early activation of PI 3-K seen within minutes and normally associated with cytokine signaling. However, kinetic experiments showed that both of these T cell growth factors induce a distinct and sustained phase of PI 3-K activity several hours after stimulation. This delayed activation correlates with cell cycle induction and from studies using inhibitors of PI 3-K signaling, we show that this later phase, unlike the early activation within minutes, is required for cell cycle induction. The data presented here will have major implications for our understanding of the mechanism of T cell proliferation as well as the regulation of PI 3-K activity. The rapid expansion of T lymphocytes following Ag stimulation is a major event in the mounting of an immune response. Proliferation of T cells is thought to be dependent on the activity of several T cell growth factors. The most important of these is probably IL-2, but several other cytokines including IL-4, IL-7, IL-9, and IL-15 also share this property. The similar response of T cells to this group of growth factors can in part be explained by the sharing of the common γ-chain subunit by the receptors for these cytokines (1) and as a result of this the activation of a similar repertoire of signaling molecules, among them Janus kinase (Jak)4 1 and Jak3, which are both essential for T cell growth. Although the signaling pathways activated by these growth factors have been extensively studied, their contribution to the proliferative response of T cells is unclear. The requirement of STAT5, an immediate substrate of activated Jak kinases, for T cell growth is still unclear with conflicting evidence in the literature (2, 3). Also, unlike the other T cell growth factors, IL-4 activates STAT6 rather than STAT5 (4). The ras/raf/p42/44-mitogen-activated protein kinase (MAPK) pathway, essential for proliferative responses to growth factors in many cells, is not required in T cells (5). Moreover, this pathway is only activated by IL-2 and IL-15, but not IL-4 or IL-7. Phosphatidylinositol 3-kinase (PI 3-K) and the distal effectors, phosphoinositide-dependent protein kinase (PDK) 1/2, protein kinase (PK) B, and p70S6K, have been associated with cell growth and survival in many systems. Furthermore, many T cell growth factors, including IL-2 and IL-7 (6, 7), have been shown to activate this pathway although the IL-7 study, in particular, has not been confirmed in mature T cells in which PI 3-K has been implicated in IL-2-induced cell cycle progression and the regulation of S-phase markers such as Rb hyperphosphorylation (6). The same study also showed that IL-2-induced T cell proliferation is inhibited by the PI 3-K inhibitor LY294002 (6). In support of such a role for PI 3-K, we have recently demonstrated that the anti-T cell proliferative effect of SB203580 did not relate to effects on p38 MAPK, the best documented target of the drug, but rather correlated with the inhibition of IL-2-induced PI 3-K signaling (8). Specifically, SB203580 used at the higher concentrations than needed for anti-p38 MAPK effect inhibited the activity of the PKB/Akt kinases, PDK1/2, preventing phosphorylations of PKB on threonine (T) 308 and serine (S) 473. The IL-2R subunits α, β, and γ all lack a YXXM motif, the canonical site for the binding of the regulatory p85 subunit of PI 3-K following phosphorylation of this motif on the tyrosine residue. It has recently been reported that IL-2-induced PI 3-K activation requires tyrosine (Y) 338 in the acidic region of the IL-2R β-chain (9, 10), which acts as a docking site for the adaptor protein shc (11). However, receptor deletion studies found that Y338 and the entire acidic region in which it is located are dispensable for IL-2-induced proliferation (12, 13). These observations contradict earlier reports of a requirement for PI 3-K activity in T cell proliferation. Some of these early studies have recently been questioned due to possible dysregulation of the PI 3-K pathway (14, 15). We have therefore revisited the correlation between PI 3-K activation and cell cycle regulation by examining IL-2-induced proliferation in cell lines as well as primary human T cells. Using BA/F3 cell lines stably expressing reconstituted IL-2R, we show that deletion of the acidic region of the IL-2R β-chain results in loss of IL-2-induced PI 3-K activation, although the proliferative response remains intact. Similarly, we observed that IL-7 could not activate the PI 3-K pathway in mature primary T cells. However, regardless of the failure to activate the PI 3-K pathway, proliferation of IL-7-stimulated cells or cells expressing the acidic deletion mutant of the IL-2R β-chain was still sensitive to inhibition of the PI 3-K pathway. These discordant observations were reconciled by the identification, reported here for the first time in T cells, that IL-2 can induce a distinct second phase of PI 3-K activation over hours after the initial peak of activity seen within minutes. This later phase is not dependent on the acidic region of the β-chain and is also induced by IL-7 in mature T cells. These observations have a major implication for our understanding of the mechanism of activation and role of the PI 3-K pathway in T cell proliferation and highlight the complexity of relating short-term signaling events to longer-term effects such as cell cycle progression. IL-2 was purchased from Chiron (Emeryville, CA). Murine IL-3 was made in-house as a crude hybridoma culture medium and used at a 1/100 dilution. Anti-phospho-serine 473 Abs to PKB were obtained from New England Biolabs (Hitchin, U.K.), while the Abs for phospho-FKHRL1, FKHRL1, and PKB were purchased from Upstate Biotechnology (Lake Placid, NY). Anti-pRb was obtained from BD PharMingen (San Diego, CA), while Abs to cyclin E, p70S6K, and p42/44 MAPK were purchased from Santa Cruz Biotechnology (Santa Cruz CA). SB203580 and LY294002 were bought from Calbiochem-Novabiochem (Nottingham, U.K.). HRP-conjugated secondary Abs were purchased from DAKO (Glostrup, Denmark). The IL-2-dependent CT6 cells were grown in RPMI 1640 medium supplemented with 5% FCS, 2-ME, and 5 ng/ml IL-2, while the IL-3-dependent murine pro-B cell lines (F7, A15, and S25 kindly provided by Prof. T. Tonguchei, University of Tokyo, Tokyo, Japan), BA/F3, were cultured in the presence of IL-3 and G418 (0.2 mg/ml), as previously described (8). The primary human T cells were prepared by separating over a Ficoll-Hypaque layer and culturing in the presence of 50 ng/ml anti-CD3 (OKT3) for 48 h, as described previously (8, 16). Following activation, cells were washed and rested overnight to synchronize them in G1, washed again on the morning of the experiment, and finally resuspended at 2.5 × 106 cells ML-1. One milliliter of this cell preparation was added per well in 12-well plates before preincubation with inhibitors and stimulation. For cellular proliferation assays by thymidine incorporation, washed and synchronized cells were resuspended at 1 × 106 ml−1 and 100 μl/well in 96-well plates. Cellular proliferation was measured over a 24-h period of mitogen stimulation using thymidine incorporation, as previously described (17). In all experiments, the sample shown in the absence of drug treatment contained the vehicle (DMSO) at the highest concentration (0.3%). Staining for annexin V or propidium iodide was performed using the apoptosis detection kit (Alexis Biochemicals, Nottingham, U.K.) according to the manufacturer’s instructions. Staining was detected using a BD Biosciences LSR FACS analyzer and 10,000 events were recorded. Briefly, 5 × 106 cells were lysed in 0.5 ml of p70S6K lysis buffer (1% Nonidet P-40, 150 mM NaCl, 1 mM PMSF, 10 μg/ml aprotinin, 10 μg/ml leupeptin, 10 μg/ml pepstatin, and 1 mM sodium pervanadate) and the postnuclear lysate was precleared with 25 μl of protein A-agarose for 30 min. The precleared supernatant was then preincubated with 5 μl of rabbit antiserum to p70S6K (Santa Cruz Biotechnology) for 1 h and additionally with 25 μl of protein A-agarose on a rotating wheel for another 1 h at 4°C. The final immune complex was washed twice in 0.5 ml of lysis buffer and twice in 0.5 ml of kinase assay buffer (50 mM MOPS (pH 7.2), 1 mM DTT, 30 mM ATP, 5 mM MgCl2, and 10 mM p-nitrophenylphosphate). Forty-five microliters of assay mixture (made up of 35 μl of kinase assay buffer, 5 μl of 125 mM substrate peptide (KKRNRTLTK), 5 μl of 50 μM PKA inhibitor, and 5 μCi of [γ-32P]ATP) was added to the washed immune complex pellet and the reaction was allowed to proceed for 30 min at room temperature. Reaction was stopped by addition of 50 μl of 2× reducing sample buffer and boiling for 5 min. The peptide was separated from other reagents by electrophoresis and the gel was developed by autoradiography. The membrane (polyvinylidene difluoride or nitrocellulose as recommended by manufacturer) was blocked in blocking buffer containing 5% (w/v) milk powder in TBS/Tween 20 (20 mM Tris-HCl (pH 7.5), 137 mM NaCl, 0.1% Tween 20) for 1 h at room temperature or left overnight at 5–8°C in blocking buffer supplemented with 0.1% (w/v) azide. The membrane was then washed three times in TBS/Tween 20 for 5 min at a time, then incubated overnight with the appropriate dilution of first-layer Ab made up in blocking buffer or for PKB in 5% BSA (w/v) in TBS/Tween 20. After the primary Ab, the membrane was washed three times in TBS/Tween 20, then incubated in the appropriate dilution of the HRP-conjugated secondary Ab in blocking buffer. The membrane was finally washed again in TBS/Tween 20 before developing signal with chemiluminescent reagent according to the manufacturer’s instructions (Amersham, Buckingham, U.K.). The PI 3-K pathway is activated by most growth factors and many studies over the years have suggested a role for this pathway in cell cycle regulation. In our initial attempt to correlate PI 3-K activation with cell cycle regulation, we looked at the BA/F3 model of IL-2 signaling in which deletion mutants of the IL-2R β-chain are stably expressed, reconstituting a viable receptor complex. This model has been used to characterize the protooncogenes (18) and signaling pathways (12) required for IL-2-induced cell cycle regulation. This model therefore provided a good starting point to examine the correlation between PI 3-K activation and IL-2-incuced proliferation (19). Previous studies have shown that the membrane proximal serine-rich but not the more distal acid-rich domain of the IL-2R β-chain to be critical for proliferation. Furthermore, recent studies have suggested that the acid-rich region and, in particular, the Y338 residue within this region is required for activation of the PI 3-K pathway (9, 10, 13, 15). Using BA/F3 cells stably expressing the wild-type (F7) IL-2R β-chain and deletion mutants of the serine-rich (S25) and acid-rich (A15) regions, we confirmed that both regions are required for IL-2-induced activation of PI 3-K as measured by phosphorylation of PKB on S473 (Fig. 1⇓A). Although the upstream kinase for serine 473 has not been identified, it is well established that the phosphorylation of this residue is PI 3-K dependent (20); immunoblotting for serine 473 phosphorylation is therefore routinely used as a readout for the activation of PI 3-K. These results are interesting because the A15 cells in which IL-2 failed to activate the PI 3-K pathway readily proliferate to the growth factor, suggesting that the pathway is not required for cell cycle regulation. To investigate this further, we examined the effect of PI 3-K inhibition on IL-2-induced proliferation in A15 cells. Surprisingly, LY294002 inhibited IL-2-induced proliferation in A15 cells as it did in F7 cells. The compound SB203580 also inhibited IL-2-induced proliferation of both A15 and F7 cells (Fig. 1⇓B) at concentrations that block PDK1 function (8). These compounds also reproduced in F7 and A15 cells the inhibition of the S-phase changes of Rb hyperphosphorylation and cyclin E expression (Fig. 1⇓C) that have previously been shown to be sensitive to PI 3-K inhibition (6, 8). These structurally unrelated compounds have been documented to target PI 3-K signaling at the concentrations used and LY294002 in particular has been widely used, at these low concentrations, as a specific inhibitor of PI 3-K. The other widely used PI 3-K inhibitor, wortmannin, was found to be unsuitable for these long-term studies because of its instability. Although these results cannot discount any possibility of a PI 3-K-independent effect of these compounds, the inhibitory effect on IL-2-induced proliferation on A15 cells raised two issues. One is the possibility that the activity of PI 3-K may be required at a later time point. The other is that the regulation of the pathway in A15 BA/F3 cells may not be representative of physiological T cell signaling. The first of these possibilities can be addressed by long-term kinetic studies while the latter would require investigation in a primary cell system that recapitulates the A15 cell response to IL-2. Inhibitors of the PI 3-K pathway block IL-2-induced cell cycle progression in the absence of any detectable activation of the pathway. A, Resting BA/F3 cells expressing wild-type (F7), serine-rich deletion (S25), and acidic-rich deletion (A15) mutants of the IL-2R β-chain were activated with IL-2 (20 ng/ml) or IL-3 for 15 min, after which cells lysates were prepared and immunoblotted for phospho-S473 on PKB. B, Resting F7 or A15 cells were preincubated with SB203580 and LY294002 at the indicated doses for 1 h before stimulation with 20 ng/ml IL-2. Proliferation was measured by thymidine incorporation as described in Materials and Methods. Error bars represent ± SD (n = 3). C, Resting F7 or A15 cells were preincubated with SB203580 and LY294002 at the indicated doses for 1 h before stimulation with 20 ng/ml IL-2. After 20 h cell lysates were prepared and immunoblotted for Rb and cyclin E. pRb, Hypophosphorylated Rb; ppRb, hyperphosphorylated Rb. Equivalent amount of protein was loaded per sample following protein assay. To address the possibility that the failure to see PI 3-K activation was a peculiarity of the BA/F3 cell line, we examined signaling in a more physiological system, looking at responses to the T cell growth factors IL-2 and IL-7 in primary human T cells. We also extended these studies to the murine T cell line CT6 which we have used extensively for studies into T cell proliferation and because it proliferates well to both IL-2 and IL-7. In the CT6 cells, IL-7 failed to induce the phosphorylation of PKB on serine 473 over 30 min while inducing a robust phosphorylation of STAT5, a response that was comparable to that obtained with IL-2 (Fig. 2⇓A). 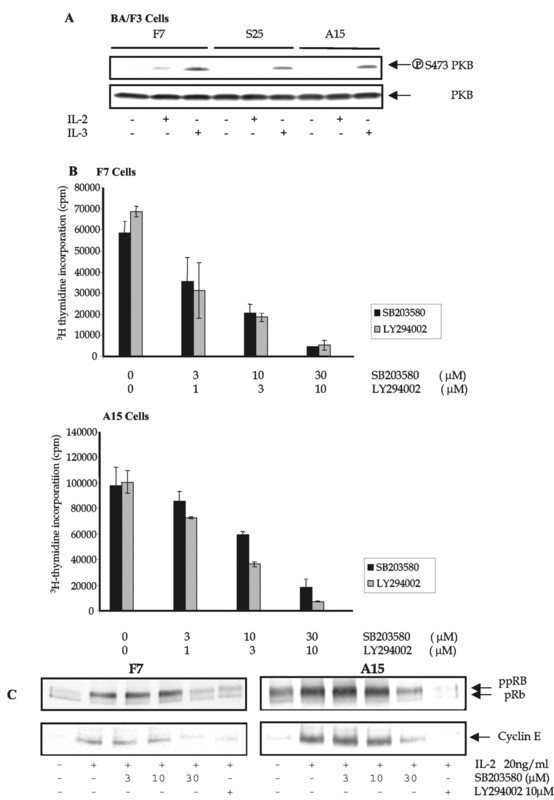 The failure of IL-7 to induce S473 phosphorylation was reproduced in primary human T cells (Fig. 2⇓B). Consistent with these observations, immunokinase assays for p70S6K, another marker of PI 3-K activation showed induction in response to IL-2 but not IL-7 (Fig. 2⇓C). We concluded therefore that the observations made in the BA/F3 model of IL-2-induced proliferation represented a physiological mechanism as recapitulated with IL-7 in primary T cells. This conclusion has important implications. First, it contradicts previous reports of IL-7-induced PI 3-K activation. Even though these earlier studies were performed in T lineage cells, it is noteworthy that they were primary murine or human thymocytes (21, 22) or the human thymocyte-derived cell line HPB/ALL (7). We therefore repeated the observations in HPB/ALL cells. 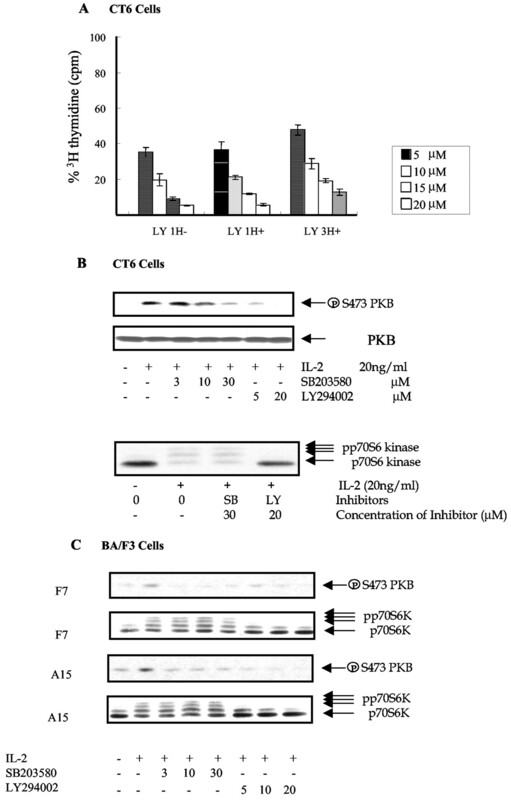 IL-7 rapidly induced S473 phosphorylation of PKB (Fig. 2⇓D) and p70S6K activation in HPB/ALL cells (Fig. 2⇓E), thus confirming the previous studies. This difference in IL-7-induced activation of PI 3-K between thymocytes and mature T cells may be developmentally important; however, the observations made here suggest it is not critical for cell cycle regulation as IL-7 is a potent growth factor for both the thymocyte and mature T lineage cells. IL-7 fails to activate the PI 3-K pathway in mature T cells. 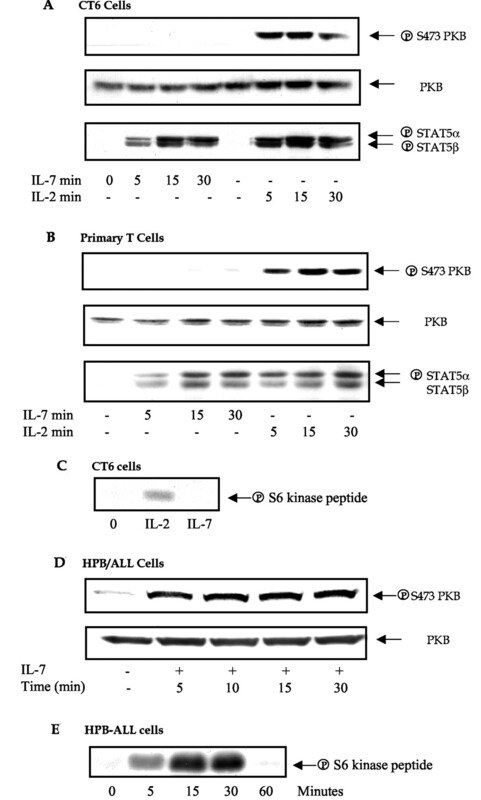 A and B, Resting CT6 (A) or primary human T (B) cells were stimulated with 20 ng/ml IL-2 or IL-7 for the indicated times, after which cells lysates were prepared and immunoblotted for phospho-S473 on PKB. The blots were reprobed for PKB and phospho-STAT5. C and E, Resting CT6 (C) or HPB/ALL (E) cells where stimulated with 20 ng/ml IL-2 or IL-7 for the indicated times, after which cell lysates were prepared and assayed in vitro for p70S6K activity as described in Materials and Methods using the S6 peptide as a substrate. D, HPB/ALL cells where stimulated with 20 ng/ml IL-7 for the indicated times, after which cell lysates were prepared and immunoblotted for phospho-S473 on PKB. The blot was reprobed for PKB. The above correlation studies led us to a PI 3-K-independent model of cell cycle regulation in response to IL-7. However, the data are also consistent with a later activation of the pathway. In the latter case, use of PI 3-K inhibitors could demonstrate a requirement for the pathway. We used the well-established inhibitor of the kinase LY294002 and the structurally unrelated compound SB203580 which has recently been reported to inhibit proliferation by targeting the downstream PI 3-K effector PDK1. Both compounds attenuated the proliferation of murine CT6 T cells (Fig. 3⇓A) and activated human primary T cells (Fig. 3⇓B) in response to IL-7. These effects were not due to any apparent toxicity of the drugs on the cells. CT6 cells treated with the 30 μM SB203580 or 20 μM LY294002 for the duration of the experiments showed only a minor increase in annexin V staining with the percentage of cells positive increasing from 8% of the untreated control to 9% in the presence of the drugs. Similarly, propidium iodide staining only increased from 5 to 8% with LY294002 but was unaffected by SB203580. Furthermore, the induction by IL-7 of the S-phase markers Rb hyperphosphorylation and cyclin E expression were also blocked by both LY294002 and SB203580 (Fig. 3⇓C). These observations suggest a requirement for PI 3-K activity in IL-7-induced cell cycle regulation in mature primary T cells. A likely explanation for the data is that there is an activation of the PI 3-K pathway later in the cell cycle. It was imperative at this stage to examine the longer term kinetics of PI 3-K activation in response to the respective growth factors. Inhibitors of the PI 3-K pathway block IL-7-induced cell cycle progression. A and B, Resting CT6 (A) or primary human T (B) cells were preincubated with SB203580 and LY294002 at the indicated doses for 1 h before stimulation with 20 ng/ml IL-7. Proliferation was measured by thymidine incorporation as described in Materials and Methods. Error bars represent ± SD (n = 3). C, Resting CT6 cells were preincubated with SB203580 and LY294002 at the indicated doses for 1 h before stimulation with 20 ng/ml IL-7. After 20 h cell lysates were prepared and immunoblotted for Rb and cyclin E. pRb, Hypophosphorylated Rb; ppRb, hyperphosphorylated Rb. Equivalent amount of protein was loaded per sample following protein assay. The kinetics of IL-2-induced PI 3-K activation was investigated in CT6 cells. IL-2 induced a marked phosphorylation of PKB within the first 5 min, as expected (Fig. 4⇓A); this declined within 1 h but a weaker phosphorylation signal was detectable for up to 9 h, a period over which no spontaneous signal was evident in the unactivated control cells (Fig. 4⇓A). Similarly, a sustained IL-2 activation of p70S6K was seen over the same period, as assayed by gel retardation of hyperphosphorylated forms, (Fig. 4⇓B). IL-7 induced a moderate and sustained phosphorylation of PKB and p70S6K from 3 to 12 h in CT6 cells (Fig. 4⇓C). A late phase phosphorylation of PKB and p70S6K was also seen in the mutant A15 BAF/3 cells at 3 h in response to IL-2 (see Fig. 5⇓C). 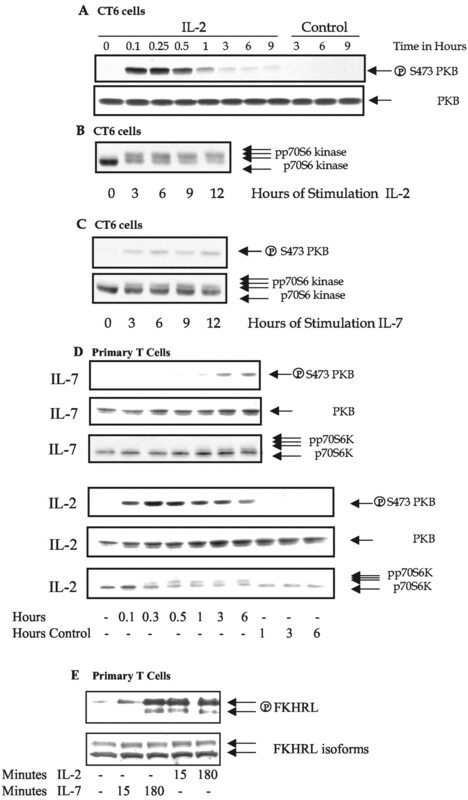 These observations were reproduced in primary human T cells in which IL-7 induced a detectable phosphorylation of PKB and p70S6K within 3 h and the signal was still present at 6 h (Fig. 4⇓D). Additional support for these observations on the kinetics of PI 3-K activation came from studies on the phosphorylation of FKHRL1, a member of the Forkhead family of transcription factors, which are phosphorylated by PKB (23). In primary T cells, a potent phosphorylation of FKHRL1 was observed at both 15 min and 3 h in IL-2 stimulated cells, whereas an equally strong signal was only seen at 3 h in IL-7-stimulated cells (Fig. 4⇓E). The slight phosphorylation of FKHRL1 in the IL-7 lane at 15 min was not consistently seen. The induction of the late sustained PI 3-K activation in response to IL-7 in primary T cells and in response to IL-2 in A15 cells that lack the critical receptor domain for early activation suggest that the late phase seen in hours is distinct from the early phase seen within minutes. Furthermore, the occurrence of the late phase correlates with cell cycle induction and proliferation. The antiproliferative effect of PI 3-K inhibition could therefore be explained by effects on this later phase of activation. IL-2 and IL-7 induce a second phase activation of the PI 3-K pathway. A, Resting CT6 cells were stimulated with 20 ng/ml IL-2 for the indicated times, after which cell lysates were prepared and immunoblotted for phospho-S473 on PKB. The membranes were reprobed for PKB loading. B, Resting CT6 were stimulated with 20 ng/ml IL-2 for the indicated times, after which cells lysates were prepared and immunoblotted for p70S6K. ppS70S6K represents the hyperphosphorylated forms. C, Resting CT6 were stimulated with 20 ng/ml IL-7 for the indicated times, after which cells lysates were prepared and immunoblotted for phospho-S473 PKB or p70S6K. ppS70S6K represents the hyperphosphorylated forms. D, Resting primary human T cells were stimulated with 20 ng/ml IL-2 or IL-7 for the indicated times, after which cell lysates were prepared and immunoblotted for phospho-S473 PKB and reprobed for PKB or separately for p70S6K. ppS70S6K represents the hyperphosphorylated forms. E, Resting primary human T cells were stimulated with 20 ng/ml IL-2 or IL-7 for the indicated times, after which cell lysates were prepared and immunoblotted for phospho-FKHRL followed by reprobing for FKHRL. Effect of inhibitors on the late activation of the PI 3-K pathway. 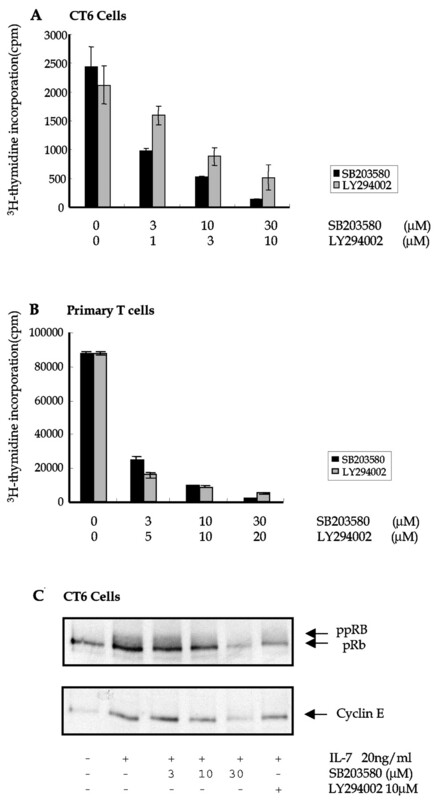 A, Rested CT6 cells were stimulated with 20 ng/ml IL-2 at time 0 and 5–20 μM LY294002 was added to the cells at varying times before and after the addition of IL-2. One hour before LY 1H−, 1 h after LY 1H−, and 3 h after LY 3H+. Cells were pulsed with [3H]thymidine the next day as detailed in Materials and Methods. Thymidine incorporation was expressed as a percentage of control values for cells treated with IL-2 and vehicle only. B, Rested CT6 cells were treated with the indicated concentrations of SB203580 and LY294002 followed by stimulation with 20 ng/ml IL-2 for 3 h, after which cell lysates were prepared and immunoblotted for phospho-S473 PKB and p70S6K. ppS70S6K represents the hyperphosphorylated forms. The phospho-S473 membrane was reprobed with PKB for loading control. C, Resting F7 or A15 cells were preincubated with SB203580 and LY294002 at the indicated doses were stimulated with 20 ng/ml IL-2. After 3 h, cell lysates were prepared and immunoblotted for phospho-S473 PKB and p70S6K. ppS70S6K represents the hyperphosphorylated forms. Phospho-S473 PKB membranes were then reprobed for PKB and showed equal loading as in other panels above (data not shown). If the late phase activation of PI 3-K is critical for proliferation, it should be possible to add the inhibitors LY294002 and SB203580 at least 3 h after stimulation without loss of effect. As shown in Fig. 5⇑A, LY294002 and SB203580 were as effective at blocking proliferation of CT6 cells when added 3 h after IL-2, as when added 1 h before IL-2 stimulation. Similar data were obtained for human primary T cells (data not shown). The effect of these compounds on the late phase of PI 3-K signaling was therefore examined. In CT6 cells, LY294002 and SB203580 inhibited PKB phosphorylation at 3 h (Fig. 5⇑B). The concentrations required of LY294002 and SB203580 (Fig. 5⇑B, upper panel) were commensurate with the effects on proliferation. LY294002 also blocked the IL-2-induced phosphorylation of p70S6K in CT6 cells. SB203580 has no detectable effect on the hyperphosphorylation of p70S6K measured in this manner, an effect we have previously observed although the activity of the kinase was inhibited (8). This might be because the target of SB203580, the constitutively active PDK1 (8), participates in a late stage phosphorylation of p70S6K on threonine 252 that is required for activation of the kinase (24). p70S6K is also phosphorylated on several other residues that can be required for kinase activity. The phosphorylation of threonine 389 is mTOR dependent (25), whereas the phosphorylation of several other residues may occur in a PI 3-K-dependent manner but without mTOR (26). Also, other kinases such as the MAPK can act as p70S6K kinases in some circumstances (27). Given the obvious complexity and the uncertainty of the full extent of the mechanisms of p70S6K phosphorylation and activation (26), it would be possible that blocking PDK1 has only a minor effect on the phosphorylation pattern of the kinase. A similar activation profile was obtained with IL-2 in F7 BA/F3 cells (data not shown). Because IL-2 induces both the early and late phases of PI 3-K activation in CT6 and F7 cells, the effect shown of the inhibitors on the later phase is not clear-cut from that on the early phase. To demonstrate an effect on the distinct late phase of PI 3-K activation, we used the A15 cells in which there is no early response to IL-2 and showed that LY294002 and SB203580 blocked PKB phosphorylation at 3 h. LY294002 also dose dependently inhibited p70S6K phosphorylation as described before (Fig. 5⇑C). The delay in the second phase of PI 3-K activation and the fact that in the case of IL-2, unlike the early phase, it did not require the acid-rich region, suggested that the mechanism of this later activation is distinct from that of the early phase and may be indirect. We therefore investigated the possible requirement of de novo protein synthesis by examining the effect of the protein synthesis inhibitor cycloheximide. In CT6 cells, whereas the early phase of IL-2 induced phosphorylation of PKB at 15 min was unaffected, the later phase at 3 h was greatly reduced in the presence of cycloheximide (Fig. 6⇓). These results were identical to those obtained in F7 BA/F3 cells that express the wild-type IL-2R. In the A15 BA/F3 cells, the only observed phosphorylation of PKB at 3 h was ablated by cycloheximide (Fig. 6⇓). In the different cell systems, the inhibition of PKB phosphorylation appeared to be greater than could be accounted for by any slight reduction in total PKB protein that did result from cycloheximide treatment (Fig. 6⇓). These observations, therefore, suggest a requirement for protein synthesis for the delayed activation of PI 3-K. The identity of the protein mediator is the subject of ongoing studies in the laboratory. The late phase of PI 3-K activation is cycloheximide sensitive. Rested CT6 and the BA/F3 cell lines F7 and A15 were stimulated with 20 ng/ml IL-2 for varying times in the presence or absence of 10 μg/ml cycloheximide (added 15 min before IL-2). Cell lysates were then prepared and immunoblotted for phospho-S473 PKB followed by reprobing for PKB. There was no evidence of early or late apoptosis induced by cycloheximide following 3 h treatment. The PI 3-K pathway has been deemed to be important for T cell proliferation (6, 28, 29). Also, we have previously reported that the inhibitory effect of SB203580 on IL-2-induced T cell proliferation (30) correlated with the attenuation of PDK1/2 activity (8). The similarity of the concentrations (3–30 μM) required for inhibition of both PDK1/2 and proliferation and the prior evidence that the PI 3-K pathway is required for T cell proliferation suggested this to be the mechanism for the antiproliferative effect of SB203580. However, recent reports have questioned the link between the PI 3-K pathway and IL-2-induced proliferation, especially from studies that have relied on mutant IL-2R transfected into cell lines (13, 15). We therefore sought to further investigate the correlation between the PI 3-K pathway and T cell proliferation in primary T cells and also used a second T cell growth factor IL-7, in addition to IL-2. The study produced some novel insights into the role of PI 3-K in cellular proliferation in general and T cells in particular. IL-7 was unable to induce the expected immediate activation of the PI 3-K in mature primary T cells. A result that appeared to confirm, in primary T cells, previous observations (13) that this pathway is not essential for cytokine-induced proliferation. However, LY294002 and SB203580 were both able to inhibit IL-7-induced Rb hyperphosphorylation, cyclin E expression, and proliferation. A similar result was obtained with IL-2 in cell lines expressing mutant IL-2R incapable of transducing the rapid activation of the PI 3-K pathway. A possible explanation for the discordance in the inhibitor data and the PI 3-K activation profile is that these compounds have targets other than PI 3-K and PDK1/2 which are required for S-phase induction. Indeed, SB203580 completely inhibits its primary target p38 MAPK at much lower concentrations which do not affect cellular proliferation; however, both p38 MAPK and the other reported target for SB203580 in the antiproliferative concentration range used, p46/p54JNK, are not required for T cell proliferation (12). The SB203580 and LY294002 data taken together would therefore support a role for PI-3K in cell cycle regulation. Another potential trivial explanation is that there is a level of activation of PI 3-K that cannot be detected by PKB phosphorylation or p70S6K activation stimulated by both the IL-2R β-chain mutant and IL-7 that is still permissive to proliferation. However, even if this were the case, the bulk of PI 3-K activation seen at the early time point will still be redundant as far as cell proliferation was concerned, and it would not explain the ability to add LY294002 at 3 h and still get inhibition. One approach to explore these contradictory observations was to look at the kinetics of PI 3-K activation over the entire duration of S-phase induction. The study went on to reconcile these observations by showing that there is a second prolonged phase of activation of the PI 3-K pathway that is induced by IL-7 and IL-2. This response could be clearly demonstrated within 3 h and was also present in IL-2-induced A15 cells. Although IL-7 induced only the late phase of PI 3-K activation, the study clearly showed that both phases are sensitive to PI 3-K inhibitors, suggesting that, rather than being independent of PI 3-K activity, T cell proliferation requires this late phase. A prolonged activation of the PI 3-K pathway has been observed before in PGDF signaling in the HepG2 cell line; however, the importance of the PI 3-K pathway to proliferation in these cells was unclear as inhibiting the kinase resulted only in a minor (20%) suppression (31). The modest effect of inhibitors could be a result of the transformed nature of the HepG2 cells, and this makes any interpretation of the role of the PI 3-K function difficult. Aberrant functioning of the PI 3-K pathway has also been seen in some cell lines, including T cells (14). Indeed, a recent study by Cipres et al. (15) claimed that the ability of acidic region-deleted IL-2R to drive proliferation in the absence of a rapid activation of the PI 3-K in BA/F3 transfectants was due to dysregulation of this pathway. However, using similar BA/F3 transfectants, we were unable to show any high basal activity and the activation by IL-3 was similar in all transfectants tested. A possible explanation for differences in our data to that of Cipres et al. (15) is the origins of the BA/F3 transfectants. The transfectants used by Cipres et al. (15) were produced in house, whereas those used here were those originally described and used by Miyazaki et al. (18). In this context, the IL-7 data are important because they show a distinct late phase activation of PI 3-K in primary cells expressing normal levels of wild-type receptors, but with no detectable early phase activation of PI 3-K. This is further supported by the observation that LY294009 is still a fully effective antiproliferative when added 3 h after cytokine stimulation. This study also found that the induction of markers of cell cycle progression, Rb hyperphosphorylation, and cyclin E expression was independent of the early phase of PI 3-K activation, indicating that these events required the later phase of PI 3-K activation. However, the mechanism by which this second phase is induced remains unclear. Our data with cycloheximide suggested a requirement for protein synthesis and this would be consistent with the delay in the activation of the pathway. Previous studies have proposed that IL-2-induced T cell proliferation was dependent on the production of prolactin (32, 33, 34, 35, 36). However, we have not been able to demonstrate the release of soluble prolactin by cells responding to IL-2 or IL-7 (data not shown). It remains possible that IL-2 and IL-7 induce the expression of a cytosolic mediator of PI 3-K activation. This study also highlighted unexpected changes in the regulation of the PI 3-K pathway between different stages of T cell development. Previous investigations have shown activation of this pathway by IL-7 in primary thymocytes or thymoma-derived cell lines (7, 21, 22); these responses are lost on T cell maturation. What role the immediate activation of PI 3-K by IL-7 may play in thymocyte function is unclear. Even more importantly, the mechanism by which IL-7 activation of the PI 3-K pathway is modulated during T cell development is not yet understood. Both thymocytes and mature T cells express similar levels of IL-7R α-chain, hence the likely explanation for loss of the early phase of IL-7-induced PI 3-K activation in mature T cells may be changes in the receptor-associated signaling intermediates. We have previously shown that the association of IL-7R subunits change with the activation state of mature T cells (16). Other groups have reported on the differential utilization of insulin receptor substrate (IRS) proteins by the IL-7R between thymocytes and mature T cells (37). Since the IRS proteins are adapter molecules involved in the activation of PI 3-K by cytokines, they may be involved in the mechanism by which IL-7-induced PI 3-K activation is modulated during T cell development. Phosphorylation of the IRS proteins by IL-7 and other common γ-chain cytokines, including IL-2, has been reported (38), although the same study did not examine PI 3-K activity in parallel. In summary, this study concludes that it is the later, prolonged activation of the PI 3-K pathway that is responsible for IL-2-induced T cell proliferation rather than the immediate, transient peak of activity. The physiological relevance of this study is underlined by the case study of IL-7 which only induces the later phase of PI 3-K activity in primary T cells. The data also support the view that the activation of the crucial late phase of the PI 3-K pathway is indirect, possibly requiring protein synthesis. These observations have uncovered an important and previously unrecognized aspect of the mechanisms by which PI 3-K regulates T cell proliferation and highlight the problems of correlating transient signaling events and longer term processes, such as cellular proliferation. We thank Prof. T. Taniguchi for the BA/F3 cell lines. We also thank Drs. Clarke, Sarma, Williams, Foey, Dean, Smith, and Horwood for reading this manuscript and Dr. Beech and P. Amjadi for help with apoptosis studies. ↵1 This work was supported by the Wellcome Trust and the Arthritis Research Campaign. F.V.L. was in receipt of a Biotechnology and Biological Sciences Research Council case studentship. ↵2 Current address: University of Glasgow Medical School, University Avenue, Glasgow, G12 8QQ, U.K.
Lin, J. X., T. S. Migone, M. Tsang, M. Friedmann, J. A. Weatherbee, L. Zhou, A. Yamauchi, E. T. Bloom, J. Mietz, S. John, et al 1995. The role of shared receptor motifs and common Stat proteins in the generation of cytokine pleiotropy and redundancy by IL-2, IL-4, IL-7, IL-13, and IL-15. Immunity 2:331. Nakajima, H., X. W. Liu, A. Wynshaw-Boris, L. A. Rosenthal, K. Imada, D. S. Finbloom, L. Hennighausen, W. J. Leonard. 1997. An indirect effect of Stat5a in IL-2-induced proliferation: a critical role for Stat5a in IL-2-mediated IL-2 receptor α chain induction. Immunity 7:691. Teglund, S., C. McKay, E. Schuetz, J. M. van Deursen, D. Stravopodis, D. Wang, M. Brown, S. Bodner, G. Grosveld, J. N. Ihle. 1998. Stat5a and Stat5b proteins have essential and nonessential, or redundant, roles in cytokine responses. Cell 93:841. Takeda, K., T. Kishimoto, S. Akira. 1997. STAT6: its role in interleukin 4-mediated biological functions. J. Mol. Med. 75:317. Crawley, J. B., J. Willcocks, B. M. Foxwell. 1996. Interleukin-7 induces T cell proliferation in the absence of Erk/MAP kinase activity. Eur. J. Immunol. 26:2717. Brennan, P., J. W. Babbage, B. M. Burgering, B. Groner, K. Reif, D. A. Cantrell. 1997. Phosphatidylinositol 3-kinase couples the interleukin-2 receptor to the cell cycle regulator E2F. Immunity 7:679. Venkitaraman, A. R., R. J. Cowling. 1994. Interleukin-7 induces the association of phosphatidylinositol 3-kinase with the α chain of the interleukin-7 receptor. Eur. J. Immunol. 24:2168. Lali, F. V., A. E. Hunt, S. J. Turner, B. M. Foxwell. 2000. The pyridinyl imidazole inhibitor SB203580 blocks phosphoinositide-dependent protein kinase activity, protein kinase B phosphorylation, and retinoblastoma hyperphosphorylation in interleukin-2-stimulated T cells independently of p38 mitogen-activated protein kinase. J. Biol. Chem. 275:7395. Gadina, M., C. Sudarshan, R. Visconti, Y. J. Zhou, H. Gu, B. G. Neel, J. J. O’Shea. 2000. The docking molecule gab2 is induced by lymphocyte activation and is involved in signaling by interleukin-2 and interleukin-15 but not other common γ chain-using cytokines. J. Biol. Chem. 275:26959. Gu, H., H. Maeda, J. J. Moon, J. D. Lord, M. Yoakim, B. H. Nelson, B. G. Neel. 2000. New role for Shc in activation of the phosphatidylinositol 3-kinase/Akt pathway. Mol. Cell. Biol. 20:7109. Ravichandran, K. S., U. Lorenz, S. E. Shoelson, S. J. Burakoff. 1995. Interaction of Shc with Grb2 regulates association of Grb2 with mSOS. Mol. Cell. Biol. 15:593. Hunt, A. E., F. V. Lali, J. D. Lord, B. H. Nelson, T. Miyazaki, K. J. Tracey, B. M. Foxwell. 1999. Role of interleukin (IL)-2 receptor β-chain subdomains and Shc in p38 mitogen-activated protein (MAP) kinase and p54 MAP kinase (stress-activated protein Kinase/c-Jun N-terminal kinase) activation. IL-2-driven proliferation is independent of p38 and p54 MAP kinase activation. J. Biol. Chem. 274:7591. Van Parijs, L., Y. Refaeli, J. D. Lord, B. H. Nelson, A. K. Abbas, D. Baltimore. 1999. Uncoupling IL-2 signals that regulate T cell proliferation, survival, and Fas-mediated activation-induced cell death. Immunity 11:281. Astoul, E., C. Edmunds, D. A. Cantrell, S. G. Ward. 2001. PI 3-K and T-cell activation: limitations of T-leukemic cell lines as signaling models. Trends Immunol. 22:490. Cipres, A., S. Carrasco, I. Merida. 2001. Deletion of the acidic-rich domain of the IL-2Rβ chain increases receptor-associated PI3K activity. FEBS Lett. 500:99. Page, T. H., J. L. Willcocks, D. A. Taylor-Fishwick, B. M. Foxwell. 1993. Characterization of a novel high affinity human IL-7 receptor: expression on T cells and association with IL-7-driven proliferation. J. Immunol. 151:4753. Willcocks, J. L., A. Hales, T. H. Page, B. M. Foxwell. 1993. The murine T cell line CT6 provides a novel bioassay for interleukin-7. Eur. J. Immunol. 23:716. Miyazaki, T., Z. J. Liu, A. Kawahara, Y. Minami, K. Yamada, Y. Tsujimoto, E. L. Barsoumian, R. M. Permutter, T. Taniguchi. 1995. Three distinct IL-2 signaling pathways mediated by bcl-2, c-myc, and lck cooperate in hematopoietic cell proliferation. Cell 81:223. Hatakeyama, M., H. Mori, T. Doi, T. Taniguchi. 1989. A restricted cytoplasmic region of IL-2 receptor β chain is essential for growth signal transduction but not for ligand binding and internalization. Cell 59:837. Brazil, D. P., J. Park, B. A. Hemmings. 2002. PKB binding proteins: getting in on the Akt. Cell 111:293. Dadi, H. K., S. Ke, C. M. Roifman. 1993. Interleukin 7 receptor mediates the activation of phosphatidylinositol-3 kinase in human B-cell precursors. Biochem. Biophys. Res. Commun. 192:459. Pallard, C., A. P. Stegmann, T. van Kleffens, F. Smart, A. Venkitaraman, H. Spits. 1999. Distinct roles of the phosphatidylinositol 3-kinase and STAT5 pathways in IL-7-mediated development of human thymocyte precursors. Immunity 10:525. Rena, G., S. Guo, S. C. Cichy, T. G. Unterman, P. Cohen. 1999. Phosphorylation of the transcription factor Forkhead family member FKHR by protein kinase B. J. Biol. Chem. 274:17179. Alessi, D. R., M. T. Kozlowski, Q. P. Weng, N. Morrice, J. Avruch. 1998. 3-Phosphoinositide-dependent protein kinase 1 (PDK1) phosphorylates and activates the p70S6K in vivo and in vitro. Curr. Biol. 8:69. Inoki, K., Y. Li, T. Zhu, J. Wu, K. L. Guan. 2002. TSC2 is phosphorylated and inhibited by Akt and suppresses mTOR signalling. Nat. Cell Biol. 4:648. Kozma, S. C., G. Thomas. 2002. Regulation of cell size in growth, development and human disease: PI3K, PKB and S6K. BioEssays 24:65. Iijima, Y., M. Laser, H. Shiraishi, C. D. Willey, B. Sundaravadivel, L. Xu, P. J. McDermott, D. Kuppuswamy. 2002. c-Raf/MEK/ERK pathway controls protein kinase C-mediated p70S6K activation in adult cardiac muscle cells. J. Biol. Chem. 277:23065. Casagrande, F., D. Bacqueville, M. J. Pillaire, F. Malecaze, S. Manenti, M. Breton-Douillon, J. M. Darbon. 1998. G1 phase arrest by the phosphatidylinositol 3-kinase inhibitor LY 294002 is correlated to up-regulation of p27Kip1 and inhibition of G1 CDKs in choroidal melanoma cells. FEBS Lett. 422:385. Moon, J. J., B. H. Nelson. 2001. Phosphatidylinositol 3-kinase potentiates, but does not trigger, T cell proliferation mediated by the IL-2 receptor. J. Immunol. 167:2714. Crawley, J. B., L. Rawlinson, F. V. Lali, T. H. Page, J. Saklatvala, B. M. Foxwell. 1997. T cell proliferation in response to interleukins 2 and 7 requires p38MAP kinase activation. J. Biol. Chem. 272:15023. Jones, D. R., T. R. Pettitt, M. A. Sanjuan, I. Merida, M. J. Wakelam. 1999. Interleukin-2 causes an increase in saturated/monounsaturated phosphatidic acid derived from 1,2-diacylglycerol and 1-O-alkyl-2-acylglycerol. J. Biol. Chem. 274:16846. Cantrell, D. A., K. A. Smith. 1984. The interleukin-2 T-cell system: a new cell growth model. Science 224:1312. Clevenger, C. V., D. H. Russell, P. M. Appasamy, M. B. Prystowsky. 1990. Regulation of interleukin 2-driven T-lymphocyte proliferation by prolactin. Proc. Natl. Acad. Sci. USA 87:6460. Clevenger, C. V., S. W. Altmann, M. B. Prystowsky. 1991. Requirement of nuclear prolactin for interleukin-2–stimulated proliferation of T lymphocytes. Science 253:77. Clevenger, C. V., A. L. Sillman, J. Hanley-Hyde, M. B. Prystowsky. 1992. Requirement for prolactin during cell cycle regulated gene expression in cloned T-lymphocytes. Endocrinology 130:3216. Prystowsky, M. B., C. V. Clevenger. 1994. Prolactin as a second messenger for interleukin 2. Immunomethods 5:49. Sharfe, N., C. M. Roifman. 1997. Differential association of phosphatidylinositol 3-kinase with insulin receptor substrate (IRS)-1 and IRS-2 in human thymocytes in response to IL-7. J. Immunol. 159:1107. Johnston, J. A., L. M. Wang, E. P. Hanson, X. J. Sun, M. F. White, S. A. Oakes, J. H. Pierce, J. J. O’Shea. 1995. Interleukins 2, 4, 7, and 15 stimulate tyrosine phosphorylation of insulin receptor substrates 1 and 2 in T cells: potential role of JAK kinases. J. Biol. Chem. 270:28527.